(Some of the details on this page pertain to Flaanimal 3.0, we will add 4.0 specific notes to this page shortly). We will maintain this page as a central location to gather tech specs, notes, and see if your particular questions about your frameset have been answered. We will update this page on an ongoing basis with questions that we recieve. Our goal is to make building and owning a Flaanimal an smooth experience. Is your frame size AND color correct? The seatpost collar protector has a number written on it that is not the frame size. Apologies for the confusion. 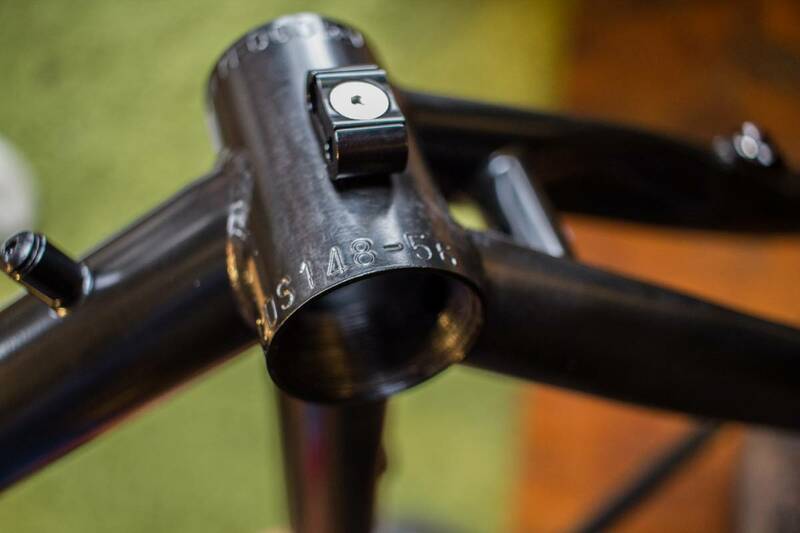 The frame size is noted on the non drive side of the bottom bracket shell. The last two numbers of that number are your frame size. CDS148 – 48, 50, 52, 54, 56, 58, or 61. 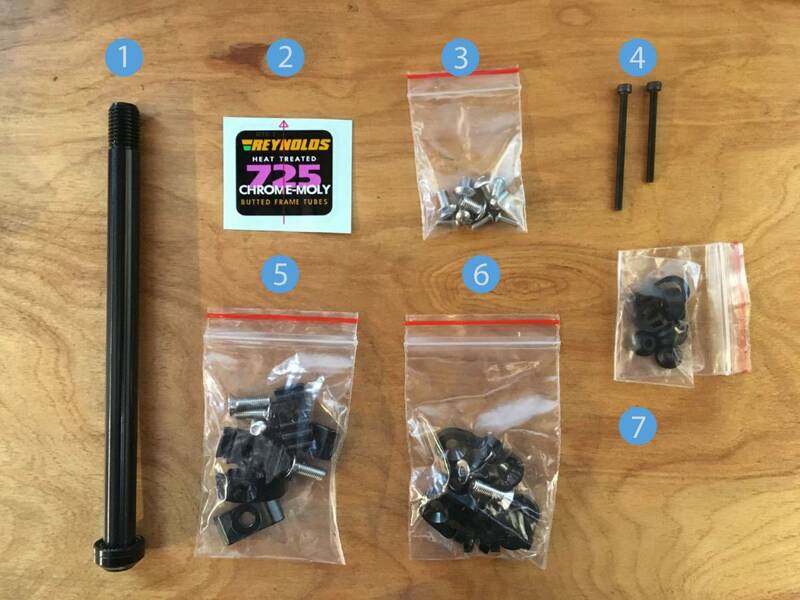 Your Flaanimal (3.0, 4.0, and 4.1) frameset came with a bag of hardware. Inside that bag are other bags with different parts for different build configurations. Lets take a look at what each group of parts is. (1) 12mm x 142 rear through axle. Both axles use a 6mm hex key to tighten it. Torque settings for the axle are 10nm of torque. The front axle is a 15mm x 100. As of this writing our axles are not a universal fit. If you prefer to use a different axle it must match these specs to fit our frame / fork. Thru axle for fork: φ15 x M14 x P1.5 x 130L (with thread) (1.5 is the thread pitch). Please note that on the front axle the threads step down to 14mm at the threads. In the near future we will make a new threaded insert available for your fork. A simple swap of the threaded insert will allow you to run a standard 15mm x 100 through axle with 15mm threads. This is a more common axle standard and many other axle options from other vendors will then fit the fork. The new insert is in production now. We will add a link to it on the store when it is available. Your Flaanimal 3.0 frameset is bona-fide Reynolds 725. We left it up to each individual owner to put the decal where they prefer to show it or to leave it off completely. To apply the decal peel back the clear transfer backing with the decal attached. Used the red alignment arrow to help center it on your frame. Press firmly into place then peel the clear backing away to leave the decal in its final position. The smallest bolts in this baggie are used to attach the cable and brake housing along the chain stays. If you are building your Flaanimal as a fixie or single speed you can remove the housing guides completely and clean up the appearance of the frame. 4.0 and 4.1 frames have rubber internal routing plugs instead of the metal external routing guides of 3.0. Your Flaanimal frameset features interchangeable sliding dropouts. In order to correctly align the rear wheel and center it in the frame the dropouts use two small set screws which allow precise micro adjustment. These micro alignment screws are not strictly necessary, you can also leave them off the bike and center your wheel visually if you like. The choice is up to you. Both 8mm (5mm hex) dropout bolts must be loosened on each dropout. Perform micro alignment of the rear wheel with the wheel installed so that you can verify that it is centered. When wheel is centered re-tighten the 8mm slider bolts re-tightened in the final dropout position. Torque bolts to to 12-15lb feet of torque. Do not use excessive torque as you can strip the bolts and / or the aluminum sliders. If desired you may use blue threadlock such as Loc Tite on the set screws and slider bolts in order to keep all components tight. Do not use a permanent thread lock or you won’t be able to re-adjust the slider in the future. (5) (6) Routing hardware kit for 2x drivetrains. The 3.0 Flaanimal comes with 1x hardware pre-installed on the frame but we also supply 2x or Single Speed hardware with each frame. The 4.0 and 4.1 Flaanimals use internal routing and various hardware plugs for different combinations of shifter or brake housing. 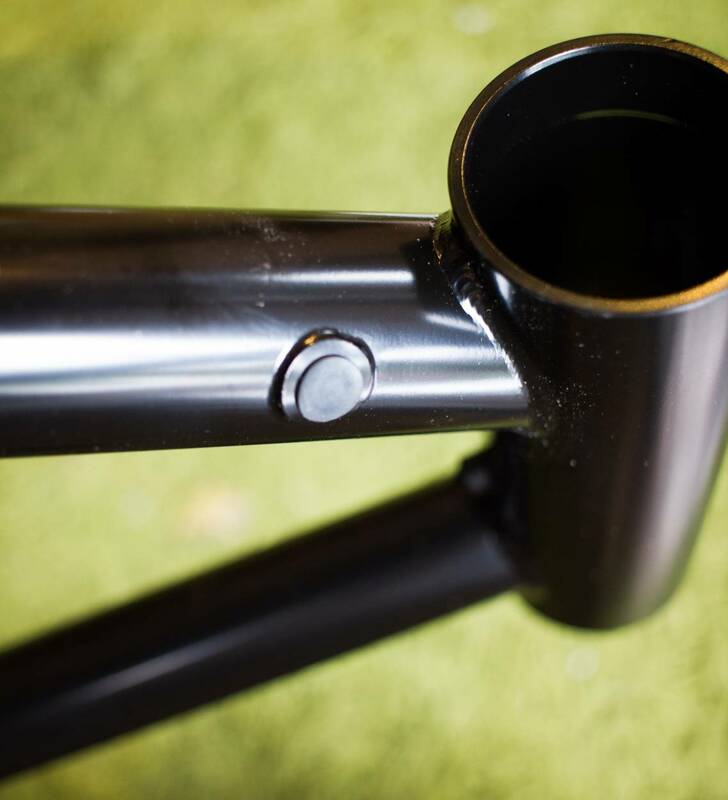 3.0 1x hardware has two grooves in each hardware piece running along the downtube. One groove is for the rearderailleur cable, one is for the rear brake. 3.0 2x hardware has 3 grooves in each hardware piece. The two outer grooves are 4mm for derailleur housing and the center groove is 5mm for brake lines. 3.0 SS hardware has a single groove for 5mm brake lines. 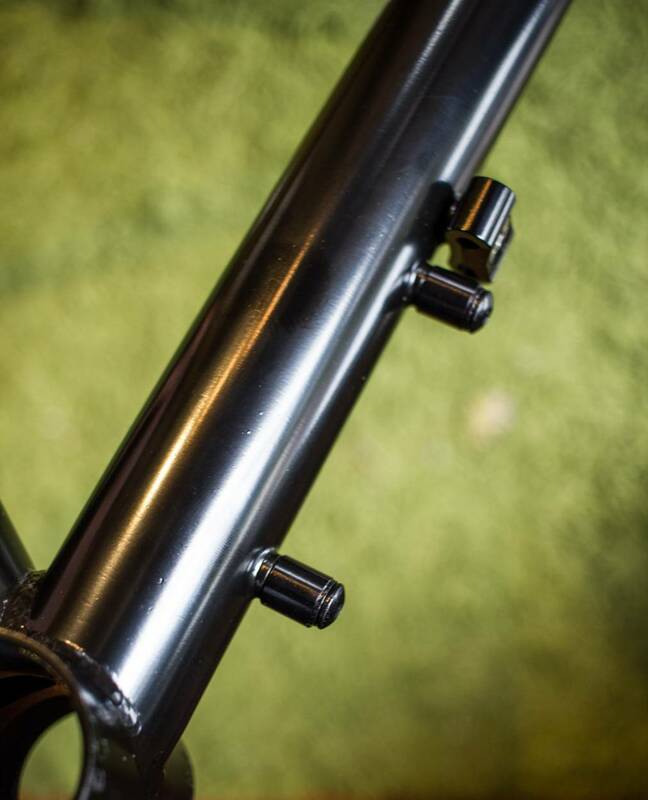 On 3.0 There are three routing points on the down tube that the routing hardware are affixed to. The 4th routing point around the BB is pre-installed with 1x routing hardware but we found that this hardware and 2x hardware is not suitable for use on our frame because it pulls brake and derailleur lines too close to the center of the frame and could result in your brake and derailleur lines rubbing on a larger diameter tire. Instead of using any routing hardware on the frame we’ve simply routed directly from the lowest downtube routing point, loose around the bottom bracket, and directly into the chain stay routing. On 4.o and 4.1 frames we left this BB shell hole as a drain hole which prevents water from pooling in the BB and corroding the frame from the inside. Apologies for the dirty example photo, but we roll dirty around here. (7) Clips for chain stay routing and Di2 caps. In order to attach brake and derailleur routing to the chain stay guides use the guides small c-clips in this bag. Also in the bag are small rubber caps for owners who build with Shimano Di2 electronic shifting. By default the Di2 holes in the frame are sealed with a small plug, but these can be swapped with what is in the bag for Di2 use. Di2 is run internally in the downtube on this frame. The wire should then run into the BB shell and up into the seat tube where Junction B would attach to a seatpost mounted battery wire, then wires would exit the two holes in behind the seat tube for the front or rear derailleur. 4.1 framesets use T47 threaded BB shells which allow more clearance for Di2 wiring so any T47 BB with external cups can be used for those builds. If you are building a 2x drivetrain (one with a front derailleur) you will need a seat tube mounted removable housing stop. We did not build the housing stop into the frame because we want to keep the frame tidy for 1x and single speed owners. If you need that part we are happy to provide one, just send us an email. If you are running 160mm rotors on your Flaanimal your front brake caliper comes with a mounting plate that by default can flip to convert between 140 and 160mm. SRAM rear brakes come with a 160mm adapter as well, but Shimano and other brands may not. If you need a rear 160mm adapter we can sell you one for $8 HERE. 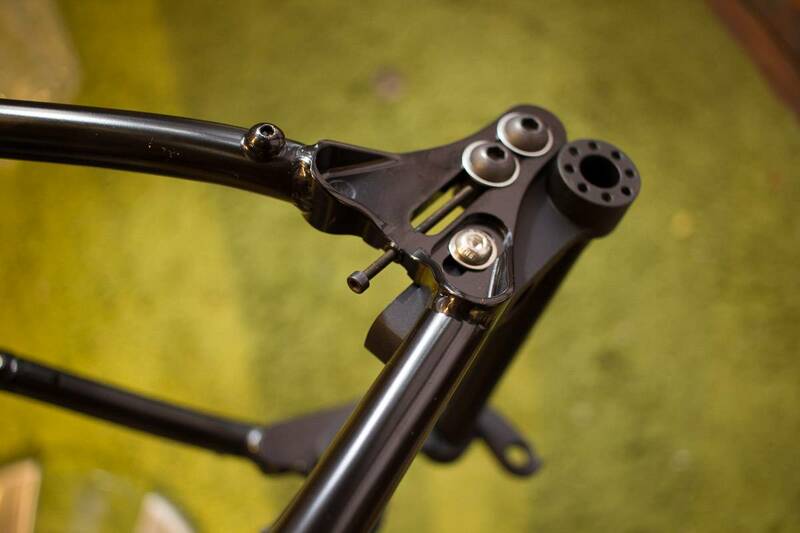 In the below photo the rear 160mm adapter is shown on the left and the seat tube housing stop is shown on the right. If you wish to run post mount brakes on your Flaanimal you will need a 140 or 160mm post mount adapter for the fork. We have these in stock for $10 + shipping. Just get in touch. use a matched pair of Paragon Machine Works post mount sliders instead of our flat mount slider. 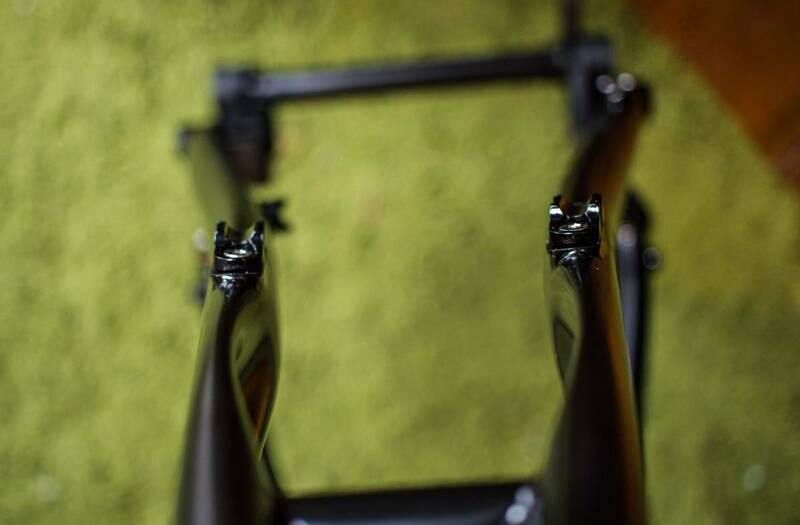 The flat mount sliding dropout on the Flaanimal is a proprietary design that is made specifically for this frame. 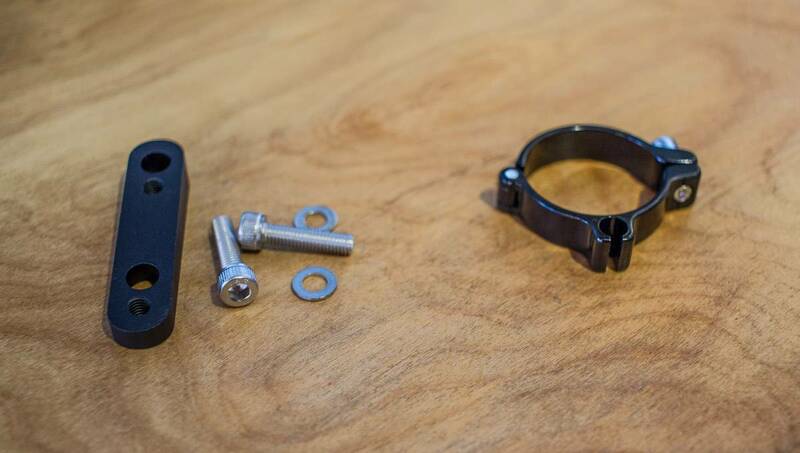 In addition to the two black 8mm slider bolts that fix the slider position there is an additional chrome bolt that we added to the frame and slider that further stiffens the assembly against braking forces. We recommend leaving this bolt in for the best possible brake feel but you may remove it if you want to push the limits of wheel position in your frame. Flaanimal is fully Gates Carbon Drive belt drive compliant and certified by Gates. The drive side seat stay has a removable section that allows the belt to pass through the frame during installation. A belt can’t be broken and re-attached like a chain so all belt drive compatible frames feature a pass through of varying design. When removing and re-installing these bolts be sure to torque firmly and consider using a blue thread lock in order to keep the bolts securely in place. When installing a Gates belt in your frame be VERY careful to fully understand installation and care of the Gates system. Improper installation of a Gates Carbon Drive will render the system weak and it will perform poorly. A correctly installed Gates Carbon Drive should perform flawlessly and with very little maintenance for the life of the parts. Threading the internal brake line in the Spork can be pretty easy or very difficult. Sometimes we add a slight curve to the line and are able to thread it through in seconds. Other times we use a threaded spoke with a small curve and we first thread the spoke up through the fork from the bottom then attach the brake housing to the end of the spoke and guide it back down while connected. There are also YouTube videos to help illustrate how to run internal housing. Spork is rated for 12.5k of combined loads on the eyelets of the fork. So if you want to add a rack go ahead and do so but do not exceed 12.5 kilos. 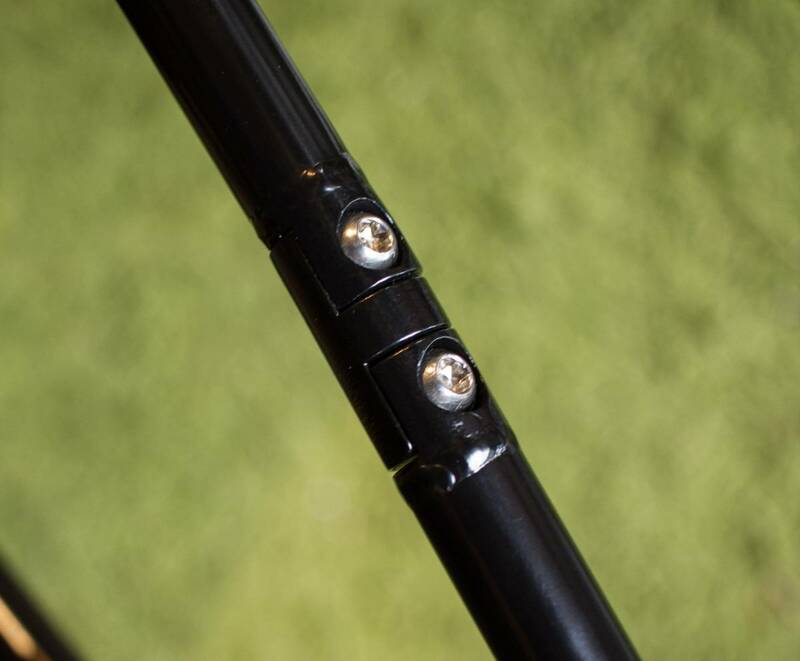 When attaching a rack through the fork crown you must use an appropriate male / female crown bolt and thread the bolt completely though the crown of the fork. Every rack is different so some racks may require washers, spacers, or customizing when attaching them to the Spork. You can attach water bottle cages to each leg of the Spork if you like using the two mid leg eyelets. Spork can also accommodate fenders. 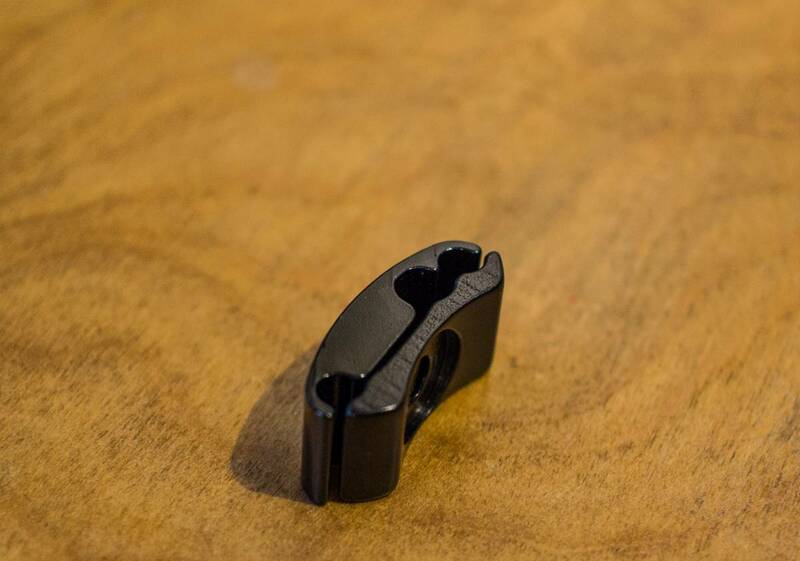 If you need to run a 12mm front through axle on your Spork we sell adapters here. There is a third water bottle cage on the Flaanimal frame that mounts near the bottom of the down tube. 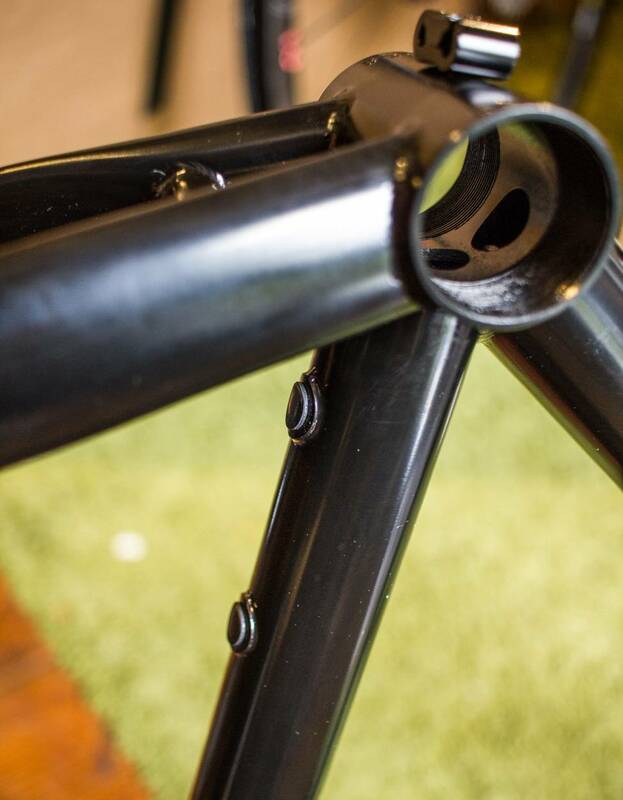 In order to clear the downtube housing guides we included spacers with each frame on 3.0 framesets. On 4.0 and 4.1 framesets no spacers are needed because routing is internal. Seat Tube: 27.2. Collar provided with each frame. Tire clearance. Varies per rim and tire manufacturer but generally 42-45mm (depending on rim width) at 700c and 48c at 650b are good general max sizes. For Rohloff hub installations we now sell a Rohloff compatible slider set. 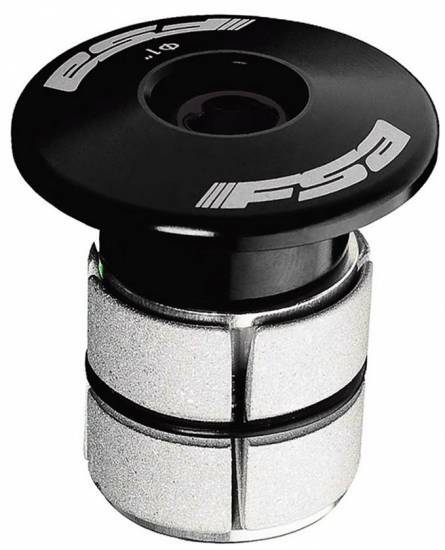 It is also compatible with QR and flat mount brake installations as well as Alfine hubs. 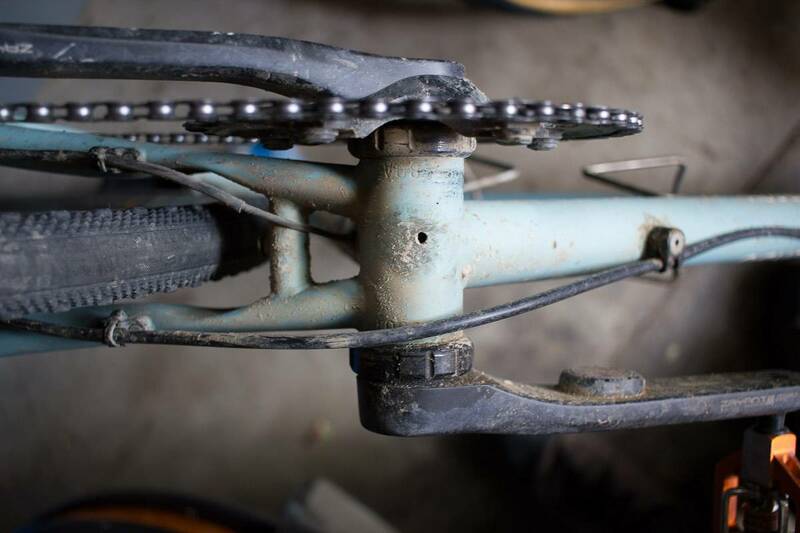 Some mechanical flat mount brakes do not clear the frame in the back. This varies by brand. We’ve verified that TRP Spyre do fit the standard slider, but Reever and Shimano 305 calipers need our off the back flat mount slider. We sell a single speed drive side dropout for those running single speed or belt drive setups. If you have questions get in touch and we are happy to help.